This photo from instructor Marla- she's out on the water right now teaching a Basic Cruise & Learn 5 day on-the-water course. Wouldn't you like to be out on the water too?Â Check out our courses, CLUBS, and charters- or give us a call to get started! We're running the last Basic sailing class starting Wednesday this week. Not just the last course for the year, but the last class with the current format. We're breaking this course info modular components for a couple reasons. The new format is CREW and BAY SKIPPER. Both courses span less than a week in format and have different objectives. The reasons to change are to make the course shorter for ease of scheduling and to better match client objectives as they take to the water. New sailors with us have shared that courses drawn out over many weeks make it hard to balance with their busy lives. In addition, part of having fun on the water is having the level of experience that matches the level of responsibility. Many people want to just crew aboard the boat and have fun. Want to crew aboard a bigger boat? Do the CREW module and then our CRUISING NUTS & BOLTS weekend. 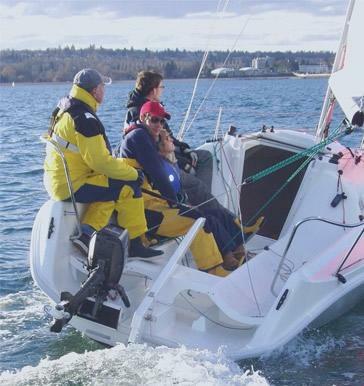 Want to be a skipper on the day sailing boats and cruise English Bay? Then proceed to the BAY SKIPPER after CREW. Feel free to get some practice as a crew member in between. Want to get to the bigger cruising boats? Add the third module of CRUISING NUTS & BOLTS. Both CREW and BAY SKIPPER run two evenings in the classroom during the same week and the on the water component involves the entire weekend that same week.